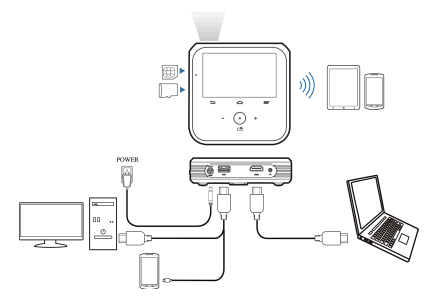 The Sprint LivePro projector user manual consist 90 pages with file size of 1.07 MB. In the manual you can find reference information such as device layout, setup and activate device, using touchscreen navigation, Customize the Home Screen,using TouchPal Keyboard, tutorial saved project in MicroSDHC, Project an HDMI Source, Create a Google Account, ets. Then about using Google play store, using Google Play Movies & TV App, Turn Wi-Fi On and Connect to a Wireless Network, Virtual Private Networks (VPN) setting, Bluetooth Tethering, using mobile hotspot, Connect to Mobile Hotspot, using WPS, using gallery, watch video, Send Pictures or Videos Using Bluetooth, and more. Other important information such as using power bank, using Connect a Bluetooth Headset or Car Kit, Update Your Device Firmware, operating system and profile. For setting you can read on page 58 for example airplae mode, bluetooth and wi-fi settings, Security guide like screen lock, encryption, Back Up & Reset, factory data reset, safety and more.